Buying a pre-owned vehicle involves making a lot of decisions, which means questions are bound to come up. At Waterloo Kia, we like to remove the guesswork from buying a used car or sport utility vehicle, and it all starts with our comprehensive certified pre-owned Kia vehicle lineup. Kia’s certification process is one of the most complete and all-encompassing in the industry, which means you’ll be satisfied with your next pre-owned vehicle. At Waterloo Kia, quality begins with a complete 135-point inspection on all our certified pre-owned vehicles. This inspection covers the main mechanical components as well as a wide range of internal and external areas of the vehicle. Once the inspection is complete, you’ll know that no stone has been left unturned, and there won’t be unpleasant surprises. It doesn’t end there. 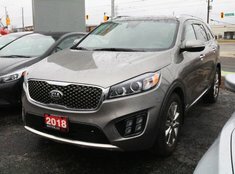 Every certified pre-owned Kia also features a complete CarProof vehicle history report that documents where the vehicle has been and its history. Once you’ve found the right certified pre-owned vehicle for your needs, you’ll be impressed with the financing options available to you. With low interest rates and flexible terms, these financing solutions make it much more affordable than you’d think to purchase your next pre-owned car or sport utility vehicle at Waterloo Kia. If you’re not happy with the vehicle you’ve purchased, you can always exchange it within 15 days or 1,000 kilometres. These are just some of the advantages that come with buying a certified pre-owned vehicle at Waterloo Kia. Contact us or visit us today to check out our complete inventory.